Lubricant blenders have traditionally used mineral oil as a base oil for machine lubricants. The first synthetic base oils became available in the late 1920s. Increased hydroprocessing also means that some mineral oils are either designated as synthetic oil or analogous to synthetic base oil. This news item will explore the properties and uses of different types of mineral oil and different types of synthetic oil. Additionally, It will also explore differences of properties of base oils within these categories. Worldwide, the majority of lubricant manufacturers primarily use Group I base oil. Industry analysts expect this Group I dominance to continue until 2020. Many producers and formulators consider that Group III is more like a synthetic oil, despite being produced from mineral oil feed stock. Lubricant blenders use mostly mineral base oils for high volume and price sensitive applications, due to the low cost, widespread availability, and ease of use. Speciality blenders use synthetic base oil for specialized higher value applications. Demand for mineral base oils far exceeds that for synthetic oil. 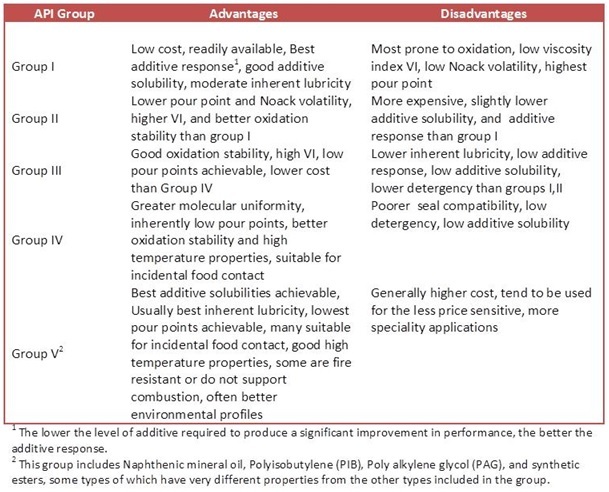 The table shows a summary of some of the most common advantages and disadvantages of the API groups of base oils. However, one should note that, even within groups, individual base oils can sometimes exhibit different performances than others in the group. This is particularly true for group V, which is an amalgam of various synthetic base oil types. Group I and Group II mineral oils have traditionally been used for the higher volume applications, such as engine oils and and for some of larger volume industrial lubrication uses. The development of more modern cars and more stringent specifications means that higher performance base oils are now needed for the higher specs. Many higher tier synthetic engine oil formulations use Group III base oils and their use for specialist industrial lubricants is also increasing. Changing from Group I or Group II to Group III can be fraught with difficulty. The differences in characteristics behaviour between Group I and II are much less significant than the differences between group III and the other two mineral oil groups. Moreover, Group III oils are closer in structure and behaviour to Group IV synthetic oils than to other mineral oils. In particular, the lower additive solubility and reduced additive response can cause problems for formulators in changing over from other mineral oil API groups. Group IV consist of poly alpha olefin (PAO) synthetic base oil types. PAOs do not contain the natural inhibitors and antioxidants that are present as impurities in Group I and Group II mineral oil. They also have lower additive solubility and additive response. This means that they require a greater treat rate of additive. However, when fully additized, the lubricant performance is often significantly better than that which blenders can achieve using mineral oils. Group V consists of any base oil that does not fit into the other four groups. Synthetic Esters, poly iso-butylenes (PIB) alkyl benzenes and poly alkylene glycols (PAG) are group V synthetic base oils. Although a mineral oil type, API also consider naphthenic oil to be group V. Moreover, with the exception of having low impurity levels and good additive solubility, naphthenic oils share few of the other typical characteristics of this group. Synthetic ester base oils are condensation reaction products of a fatty acid plus an alcohol, diol, or polyol. Furthermore, the chemical structures of the acid and alcohol raw materials determine the properties of the base oil. Consequently, speciality ester manufacturers can engineer the properties of the base oil to meet the precise requirements of certain application types. Typically, end users use ester based lubricants for high temperature, 2-stroke oil, and marine lubricant applications. Many formulators use synthetic esters for eco-friendly lubricants and lubricants for incidental food contact applications. Poly iso-butenes (PIB) are very versatile and can act as synthetic base oils or as additives. Typical characteristics include excellent high temperature properties, excellent drying oil characteristics, plasticising properties, excellent adhesion, and excellent lubricity. For these reasons, manufacturers of lubricants, greases, food grade lubricant, forming lubricants, sealants, cling film, and hot melt adhesives all use PIB. Higher molecular weight grades are rubbery solids. Polymer formulators add these grades to thermoplastics, elastomers, or rubbers to make to cling film wraps or make hot melt adhesives. The PIB component adds tackiness and flexibility to these products. Some very specialised applications use polyalkylene glycols (PAG). Tradtionally, there has been a limited market for PAG lubricants. However, this market has started to grow in recent years. Typically, PAGs have good inherent lubricity, good environmental profiles, and they are non-combustible. However, they aslo have somewhat unpredictable additive solubilities. PAG can also be used for incidental food grade lubricant and grease applications.